I'm happy to share that the first peer-reviewed article from my collaboration with the Giger Lab has been published. You can read more here. With one final exam yet to administer, the Spring 2018 Semester is almost completely done. It has been a very busy, but very fulfilling semester. Spring brings a whirlwind of abstract deadlines in the medical imaging community. 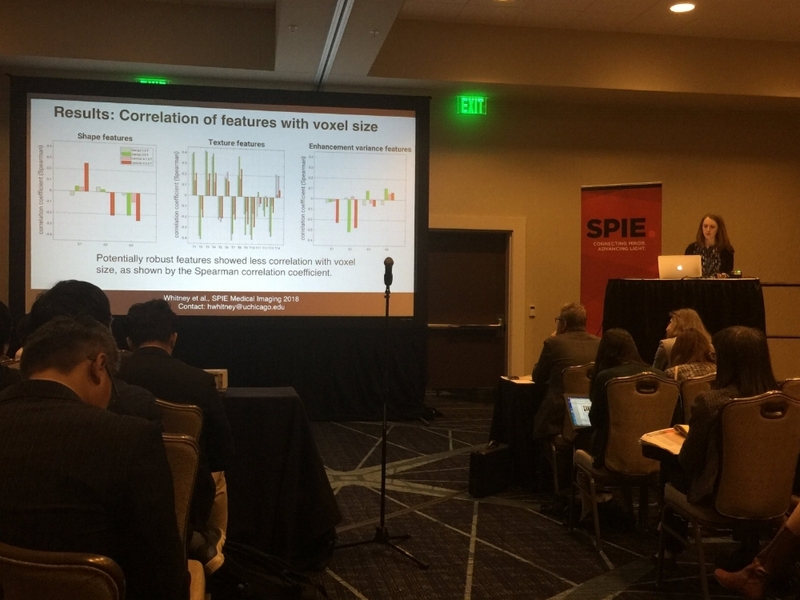 Since January, I have prepared two conference proceedings papers, given a presentation (at SPIE Medical Imaging), written six conference abstracts (two have been accepted, four pending review), and sent in revisions on a manuscript and had it accepted (update on that soon!). It's all a big increase in productivity for me compared to my pre-tenure time, when I was completely solo. My collaboration at the University of Chicago has been very fruitful and really fun. I enjoy working with the group and I love that there is an opportunity for me to contribute (with my imaging physics background) and for me to learn (deep learning! statistical interpretations of imaging beyond model fitting! and so much more.) I am really grateful for the opportunity to be associated with the Giger Lab. My courses were fairly uneventful. None of them were new, but as always, there are approaches to revise and even a chance for me to understand the material better. Next academic year brings some new preps, as I will be teaching what we call an "advanced integrative course" on the physics of sound (which replaces my old physics of music course) and my department's new data analysis and presentation course (we finally split our two-credit-hour advanced lab-type course into two, two-hour courses). And this fall I am looking forward to my husband getting some adjunct hours in our department, because he will be teaching the labs for a course for which I am the course instructor. I love teaching with him. I'm biased, but we make a good team. I'll need to shake a bit of dust out of my brain, though, because I haven't taught first-semester intro physics since 2014, I believe. Blogging has been light because of the many good things of this semester, but I hope to get back to it. I keep going back and forth between not believing I have anything valuable to throw out to the blogosphere, and remembering what it was like, pre-tenure, to feel like I might be the only one feeling challenged by this process. Even now, as a parent in a male-dominated field (and department) things feel off sometimes, harder than they should be, so I'm still stumbling about in some ways. And I constantly feel guilt from being on the employed side of our two-body problem. So we'll see where the blog leads. At the very least, I want to share more about research, as it has become a very fulfilling part of my academic (and personal!) life. I'm really excited about the work I am able to produce, especially because I am currently carrying a full teaching load. It is not easy, but it is fun. It brings some tensions of living between two worlds (for example, one-day registrations at two conferences this summer will take up more than half my academic year's faculty travel grant money from my institution) but I have been so energized by the work, and I am so grateful for the opportunity of my collaboration. I can't wait to share more. I just turned off the “I’m on sabbatical” out-of-office reply in my email, so I guess it is officially over. I want to share here how it went and what I learned. Have you heard of professional sponsorship? I think most faculty have heard about mentoring programs for pre-tenure faculty, even if they don't exist at their own institution. Mentoring in general is ill-defined, but it usually involves someone being available to advise someone who is coming up the ranks. Sponsorship is different. The unique quality of such a relationship, as I understand it, is that the sponsor agrees to take an active role in the advancement of the sponsored person, helping them network, recommending them for opportunities, that sort of thing, with the understanding that both the sponsor and the sponsored person will benefit from career advancement. You can read more about sponsorships in this article, and find others by googling. The American Association of Physicists in Medicine has announced its call for applications for its 2018 summer undergraduate fellowship programs. I want to make sure as many physics professors as possible know about this offering. The announcement usually comes out a bit later than the NSF REU announcements, and so I think it can get missed. If you have a student even marginally interested in medical physics, I hope you will let them know about the opportunity. You can click on the image above to go to a program flyer. In addition to the program linked to in that image, there is another wonderful program, the Diversity Recruitment through Education and Mentoring (DREAM) program. Click the image below to go to the flyer for the DREAM program. There are several nice features about the programs. The stipends are $5,000 and the ten week term can be flexible, determined by the student and the faculty sponsor. The deadline for student applications is February 2, 2018. As a physics professor at a small teaching-focused institution, with no lab staff (yet - we have a job opening for this! ), I find that I have to take on a lot of tasks that are not usually done by faculty at larger institutions. For a long time I have felt like much of what is published online about being a professor ignores this level of work needed for being a physics professor - so I'm sharing here in case my list helps others and so others can chime in with suggestions. Here's my list so far. Yesterday I gave a talk at the 2017 meeting of the Radiological Society of North America in Chicago, IL on some research that I have done with my sabbatical lab. The work itself actually started before my sabbatical officially began. In January 2017, one of my physics students (the first author on the abstract) was in a mathematical modeling course and the instructor solicited faculty to see if they had projects the students might work on for their course. I was wanting to work on a project to jumpstart my sabbatical research, and the Giger lab had the data ready to go for this assessment, so it was a good fit. Nathan worked on the project from January-May 2017, going to the University of Chicago occasionally to talk with the collaborators. I joined in a few times but was limited due to my course schedule (and then my foot injury), and we also called in to some conference calls. We submitted the abstract to RSNA in April and then I took over the project, reviewing, revising, and finalizing our research, preparing the poster and the slides for the talk, and writing a manuscript for publishing our results. I've attended RSNA most years since starting at Wheaton -- I mean, there's a world-class medical imaging conference every year within driving distance, why not? -- but it is the first time I have presented at it. When I applied to and interviewed at Wheaton, it was clear that I would have to give up doing (magnetic resonance) imaging at my home institution, as it is just not a good fit for a liberal arts institution to have magnetic resonance imaging on campus. It was a tradeoff I was willing to make, because I think there are interesting quantitative imaging questions to ask at the spectrometer level, as you can get out the factors related to the imaging itself and focus on factors that affect magnetic resonance of the substance in question. But I did miss imaging tremendously. Thankfully, I did find out about a colleague in our Applied Health Science department who does ultrasound imaging, and we formed a collaboration and published. But I've been really glad for the sabbatical work and the connection to clinical questions and methods as part of a bigger research endeavor. So, giving the talk and presenting our poster was great, but get this: every year I invite my students (broadly - I'm talking every physics and engineering student in our department) to attend RSNA. They can go for free, which is an amazing opportunity. They don't even need to go every day; I ask them to seriously consider going just one day. But in my eight years at Wheaton, only three students have gone without it being required as part of a course (I require my Introduction to Medical Physics students to attend the conference). This year, no one came at all. It baffles me. I've asked some students about this, and the reason is almost always that they feel pressure to understand through and through every single talk they attend, that they are afraid a vendor will ask them a question they don't understand - which sounds to me like it boils down to imposter syndrome. Then, I try to explain to them that I don't always completely understand the ins and outs of every single talk I go to, that the posture of a physicist (or really anyone in research) is to constantly be learning, and that's good. And they seem totally unconvinced. Friends, how do you encourage conference participation by your students, even just attendance if that opportunity comes up? How do you coach them into balancing pursuit of excellence versus taking on the posture of a learner? Episode 15 of the Best of Both Worlds podcast was about Mornings. I appreciated that the title itself was not "Morning Routines"! Sarah described her morning routine, and Laura talked about how she doesn't necessarily have one, and that you might not really need one unless you need to accomplish things daily that can be accomplished only by a firm routine. She mentioned that there is no need to get up at 5:30 AM unless you really need to do so! I'm fascinated with people describing their morning routines. Before kids, I found them aspirational, but now that I have children and they are quite intense, my ideas have definitely changed. (I read My Morning Routine mainly for the comic factor.) Here are some things I've come to realize and do in the mornings, somewhat related to being in higher ed. Related to that, I have learned that the margins between kid school start up time and my institution's course schedules in the morning are just too close to have them closely related. So many things can go wrong with course prep and demo set up that it is too risky to have a tight timeline in which I drop off a kid and assume that I will waltz into the classroom ready to go fifteen minutes later. At the very least, the most probable problem that will occur is that the projection system won't work for my 8 AM course, and our institution's tech office doesn't open until 8 AM, so it won't do me any good to get there early anyway. Additionally, sometimes I will need to doublecheck something related to course prep, which sometimes involves checking in with Physics Prof Twitter, my colleagues, or my husband, and I need to allow morning time to do that. We have also had our fair share of a kid waking up with some kind of medical issue (rash, coughing, etc.) and so I have learned that I need to have margin for my husband and I to call the doctor, make an appointment decision based on urgency and parent availability, etc. So I've learned (more about that later - the learning) for which courses I have flexibility to schedule as I wish, and I've done that so that I can focus on getting people to where they need to be and not having my first professional thing be teaching. For the past few semesters, I've been able to avoid scheduling 8 and 9:15 AM courses, and that has been better for all of us (including the students - they generally hate 8 AM courses). Laura and Sarah talked about trying to use an alarm so that it doesn't wake up other people in the house. When I can't avoid waking up before the kids do, I depend upon my FitBit Alta HR to buzz me at alarm time. At the very least it reduces one element of sound that could wake everyone up. Most evenings, my husband and I make plans for who is going to shower when the next morning. Having that locked in helps tremendously with making a morning go smoothly. We feed our kids the same breakfast most mornings: a handful of cereal (they don't like it with milk, so strange), cut up fruit, and some string cheese. And my husband just automatically makes the coffee - no wondering about who is going to do that. Friends, what is your morning routine? I am thrilled to share that I will be presenting a poster and doing an oral presentation at the 2017 Meeting of the Radiological Society of North America later this month. I’ll be presenting on the “Additive Benefit of Quantitative Radiomics in Distinguishing Between Benign Lesions and Luminal A Cancer Subtypes on a Large Clinical Breast MRI Dataset.” The research was done in collaboration with the Giger lab at the University of Chicago, where I have been working while on sabbatical. The first author is Nathan Taylor, an exceptionally bright student at Wheaton College. A screenshot of our title and author list. I'm especially thrilled because I am grateful for the opportunity to collaborate with Dr. Giger's lab. The U of Chicago personnel on our abstract have all been great to work with, encouraging and challenging at the same time. I don't want to presume too much, but I think presentations and posters from liberal arts institutions don't happen very much at RSNA. So I'm very, very excited to be presenting there.